Playing 8-Ball Pool Before starting the game, you have the option to choose easy, medium and hard. The harder it is, the more accurate the opponent's moves will be. You can aim your cue and set the power of a shot by holding the mouse button. 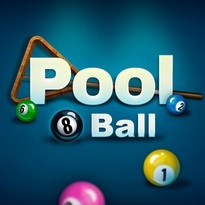 Your goal is to pocket the colored pool balls of your type while preventing the opponent from doing the same. After you pocket all seven of your pool balls, you need to pocket the eight ball (black ball) to win. You must also pocket the black ball exactly into the pocket you choose. Be careful! Hitting the black ball into the wrong pocket or pocketing the black ball before the other seven results in an instant loss.